Does your student enjoy art, music, or dance or have an interest in writing, producing films and taking photos? Then join us and have fun unleashing his or her inner artist with PTA Reflections! This year’s theme, “Heroes Around Us,” calls for their own unique interpretation through the arts. Look over the guidelines and print out an entry form today! Please read carefully over the rules for your category. Entries can be brought to school and dropped off in the office any time before the end of school on Oct. 5th. We will celebrate the contestants’ work on October 25th with a ceremony! What is reflections? It is an annual art contest sponsored by the National PTA and our local school PTA. Who is eligible? Any full time student at John B Dey. How does my child participate? He or she creates an original "work of art" in one of the categories listed on the front. This is usually done outside of school time and without help from an adult. What are the age groups? K thru 2nd grade (primary), and grades 3-5 (Intermediate). Can my child enter more than one category? Yes! Students may submit multiple works of art, either in the same category or in multiple categories. How do we submit our entry? The student submission must include the entry form with a title and artist statement. The artist statement should communicate his or her inspiration for the work and how it relates to the theme. The statement must describe the content and include at least one sentence but not exceed 100 words. JBD entry forms are available here. Are there specifics about how to present the entry, especially for dance, video or musical composition? Yes. There are too many specifics to name here for all categories. The downloads for full guidelines are available on the Va. PTA website: https://www.vapta.org/arts-and-education/reflections. When are Reflections entries due? They should be dropped off in the office by Friday, October 5th. How are the winners selected? A panel of impartial judges rate each entry on three criteria: interpretation of the theme, artistic merit, and mastery of the medium (with interpretation being the most important factor). First place winners will fill out an additional entry form before their work is submitted to the next level of competition. When are the winners announced? 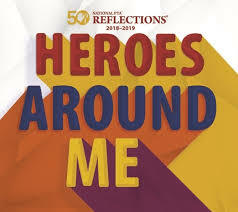 All Reflection participants will be recognized at the JBD PTA Reflections Awards Reception on October 25th beginning at 5 pm. Award ribbons will be presented, and all children will be recognized for their efforts with a certificate of participation. The first place winners will advance and be submitted to the city to compete with winners from other VB schools. Winners advance through several levels until a national winner is selected in each age group. Photography submissions may not exceed may not exceed 11 inches by 14 inches, including matting. Musical Compositions: Music recording must not exceed 5 minutes in length and IGB (one gigabyte) in file size. Video production must not exceed 5 minutes in length (AVI, MOV, MPG, MPEG, WMV, FLV). Literature submissions may be handwritten or typed. All submissions need a student entry form attached and the child's name on the back (no names on the front) of papers/items submitted. Special Artist Division is an optional division of the National PTA Reflections Program for students who's physical, cognitive, or mental health challenges meet ADA guidelines. Please check with your state PTA office regarding state availability. For complete guidelines and rules please visit PTA website (listed above).